I'm pretty surprised that I didn't review A Thousand Nights, the first book in this series, as I enjoyed it very much. Retelling 1,001 Nights seems to be a hot YA trend right now, and it really worked for the first book. 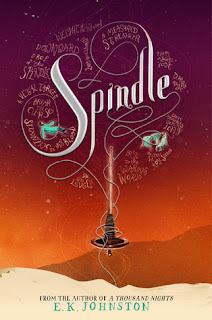 Spindle, the sequel, doesn't fare as well. Set in a land where spinning is forbidden and makes the spinners ill, a group of young exiled spinners are determined to break the spell that has destroyed their community. It starts with a cursed princess in a tower, making me think we are reading about Rapunzel, but then changes into Sleeping Beauty. The story is worse for the muddling of the two. Eventually, I bought in to the plot, so was disappointed by such an abrupt ending. Even worse, we get an epilogue, but it is abstract and doesn't actually tell us what happens to the characters with whom it took so long to connect. I was disappointed by this outing, but if the series continues, I will give it another chance.